In this episode, the second ending “An Endless Tale” and final thoughts on a season that oftentimes felt like it. It's easy to blame the franchise's three-year dormant period on this season. That makes very little sense, unless Japanese children are so discerning and fickle as to recognize the problems of the second half early enough to drop ratings to the point where Fuji TV decided not to sign on for season five. Still, without a series to follow it up, it felt like this was the end. Given all the issues in Frontier, it was a bittersweet way to say goodbye. Frontier didn't even have an epic crossover reunion to send it crashing down in a blaze of glory. Digimon would be revived, of course, but it would be a long three years until Data Squad. Enough that Frontier is considered the next turning point. Everybody who didn't quit after Zero Two got through Tamers and, assuming they had cable, at least gave Frontier a try. That means that we're done with the classic era and everything beyond is its own beast. The classic era ends with the franchise in a tired state. Digimon Frontier will go down as being a culmination of several fantastic ideas on paper that just didn't have enough momentum to work on the screen. The rich history of the Digital World sets the framework- peacemaker Lucemon goes bad, sealed by the Legendary Warriors, only to secretly get into the head of one of the new rulers. This new ruler starts a new war, and would succeed if not for Ophanimon calling for a bunch of outsiders to take on Digimon forms and essentially become the new generation of Legendary Warriors. What's not intriguing about that? With so many angles to choose from, the show disappoints by resorting to convention. This is a story that needed more plot turns and twists to keep the cast on its toes. 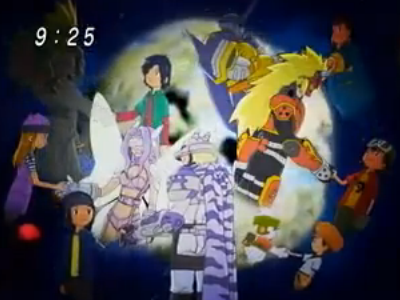 The ones we got, such as Seraphimon's death and Koichi's presence, were great, but we needed more of that. As this worldwide conflict seemed restricted to only the good and bad spirits, we needed more Digimon taking arms and fighting for both teams. We needed Mercurymon to carry out his secret play for the crown. We needed sigils, dammit! Something more epic would have worked far better for this season's cast as well. Other than the twins, none of the characters were dripping with angst, which made such an intimate adventure more difficult to pull off. So much of the conflict involved overcoming personal limitations, which weren't too restricting for these kids. Zoe's reluctance to work at making friends didn't come into play much, but throw her in a situation where she has to convince a group of large, burly Digimon to stand firm in the crucial Battle of Forest Terminal and we've got something to work with! It's a series where everything was in place to create something truly outstanding, and the story just didn't do the setting and characters justice. Every time it delves into the mythology or introduces a guest character with an awesome story, you want to follow that instead. It's the mark of a show that had what it took, but made the wrong decisions. Thanks again to everyone for reading, especially those commenting. Knowing there's an audience made it that much easier to survive the Royal Knights arc. Special thanks to everybody who opts to use that Amazon link on the right to do their online shopping, as a small percentage of anything you buy helps fund the site. Digimon Frontier is now available for pre-order! You just have to have it, right? It's a cheesy song, but it's appropriate for such an arduous adventure. The message is clear- no matter how rough it gets, you just gotta keep going. There's a certain noble beauty in that. Also, this song is the last contribution Ai Maeda makes to the TV show, which is significant as she voices Mimi in the Japanese version and sang all six ending themes for the first three seasons. Thank you so much for these. It's really great to have read these. Looking forward to your work on Savers/Data Squad - ah, but X-Evolution is first according to that one earlier post, I believe? In any case, thanks for the reviews! And now to start with the seasons I haven't seen at all and barely knew about. This should be interesting. But yes I agree with the above. Make sure X-Evolution gets its due. It fits in awkwardly but it really doesn't get the attention it deserves! "Frontier didn't even have an epic crossover reunion to send it crashing down in a blaze of glory." I dunno. The fact that "Young Hunters" had an epic crossover reunion and STILL messed that up kind of makes that series' ending worse. But overall, "Frontier" was a waste. Data Squad Episode 03: The Return of Thomas! Data Squad Episode 02: Marcus' Inner Strength!